I liked this book. A couple of online reviewers have called this book “brave,” and I will capitulate on that. This IS a brave book. There is friendship, heartbreak, an abortion, and a teenage girl in the middle of it all just being herself. What more can I say? I get it, and it’s great. 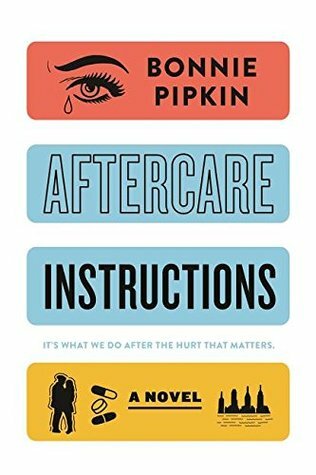 “Aftercare Instructions” is about Genesis Johnson (called ‘Gen’ throughout the book), a high school senior who is abandoned by her boyfriend immediately following an abortion at an NYC Planned Parenthood clinic (wtf?). Her father has died of a heroin overdose and the whole school has found out. Her mother is not handling his loss well (pill popping, locking herself away, etc). She can’t stand her grandparents, who take care of her sister and whose faux-religiousness she despises. Genesis’ life is pretty much her friend Rose and her boyfriend Peter. And Peter has just left her in the middle of Manhattan and won’t take her calls. To top all of this off, another friend has been cozying up to Peter in Genesis’ absence. There’s drama. There’s a catfight. Genesis is suspended from school. In the meantime, she discovers herself and her true passion: theater. As the story flashes back to the past, it is completely in play dialogue. I liked it. I loved the fact that Genesis was a strong character, yet unafraid to be vulnerable. She has issues, and yes, those issues hurt. I liked that. I can’t tell you how many YA books I’ve read in which the author seems so stuck on the idea of a strong female voice that he/she forgets to make the character believable. I also liked the fact that abortion was explored in the book, minus any yay or nay political message or proselytizing by the people in the character’s orbit. Anywho, read this book when it comes out. You won’t regret it.